Welcome our final segment on Strategy, if you are a new listener welcome to Inspiring Greatness where we interview amazing guest or share business tips on how to help you grow your business and increase profits. If you have not listened to our series yet you should start at episode 171 first. Part one - Simon Sinek’s golden circle understanding your WHY and core purpose. Part two - Identifying was operational activities can you do 3 to 5 activities that set you apart from the competition - These are process that your company uses to deliver your products or services. What makes your company different? Part 3 - How your company can surpass the competition! We highlight the difference between a SWOT & SWT analysis (Strengths, weakness, opportunities and Threats vs. Strengths, Weaknesses and Trends. Part five the X Factor to help you become 7 – 10 times better than your competition. I refer to this as the secret sauce. In Jim Collins book Good to Great, he identified a goal that great companies developed and pursued through time and was so challenging that they might not know how they would accomplish it, but were inspired to figure it out successfully. He called this goal their ‘Big Hairy Audacious Goal’ or BHAG for short. The fundamental increment or building block that drives their profit – their Profit per X as we refer to it. 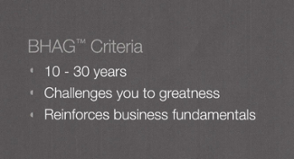 Your BHAG drives you and your strategy, with a 10 to 30-year time window. It should be challenging enough so that you are not sure how you are going to reach it and it challenges you to greatness (inspires). It reinforces your business fundamentals – it aligns and supports your One-Page Plan. Fred DeLuca, the co-founder of Subway, started the business to fund his school expenses. He describes his early success in his book Start Small Finish Big. His professor asked him to pick a 10-year BHAG and his original BHAG was 32 Subway restaurants in 10 years. It’s interesting to note that his first site failed. It was in a bad location. Once he achieved this goal of 32 restaurants (which seemed nearly impossible to Fred when he set it), his new BHAG was 5,000 stores. His next BHAG was to gain 50 cents of wallet share from every American every week. It completely changed his strategy. We see this with the locations of new Subway outlets – not just storefronts, but now in airports, malls, Walmart’s, and many other creative locations where there is “hungry traffic! In the past few years, the Subway leadership team has set a new BHAG (it appears) as they turn their focus to international growth and expansion. 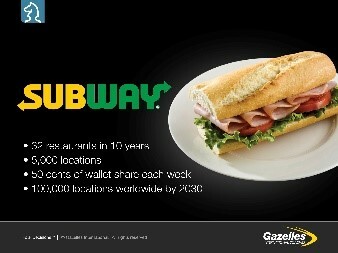 In a recent interview, Fred shared that Subway’s goal (BHAG) is to have 100,000 restaurants worldwide by the year 2030. Wow…that will be quite an accomplishment and definitely challenges them to a new level of greatness. We will start off by determining our BHAG or Big Hairy Audacious Goal, a term coined by Jim Collins and Jerry Porras. - As the name implies, it is a 10-year lofty goal, similar to Kennedy’s legendary goal of “a man on the moon in 10 years.” This lofty goal challenges your firm to greatness. It needs to be at least 10 years out. When JFK announced this after Sputnik was seen in the October sky in the United States in 1958, many scientists and engineers thought he was off his rocker! But it challenged the scientific minds to get out of the box and pursue a solution. 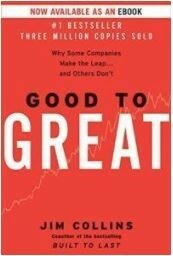 -Any company can go from “Good to Great,” according to Jim Collins, if they understand the intersection of the three following elements. This is called a BHAG. What are you deeply passionate about (your company’s Core Purpose)? What can you be the best in the world at (figuratively – not the physical world, your world!)? What drives your economic engine (and of course the KPIs)? Where the three questions overlap is the sweet spot of your BHAG – the common intersection leading to focus. This is really important! If you are passionate about something and you’re the best in the world and yet you cannot make money well that’s just a hobby. If you are the best in the world and you can make money but you’re not passionate about it that’s just a chore. If you have kids we know chores are not sustainable. 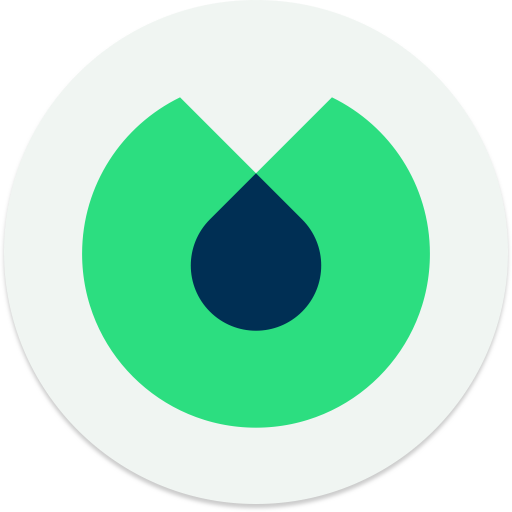 It’s important to invest time in reviewing and/or developing your Profit per X, Core Purpose and Brand Promise and meshing them together to create a draft BHAG. It’s time to do some work on the foundation of your BHAG – and just to be clear – you will NOT be able to have a complete BHAG the first time you do this exercise – it should take weeks and months. Download your free copy of Vern’s BHAG worksheet from the links on our show notes page and begin by reviewing your Core Purpose, Brand Promise (Best in the World At) and then your Profit per X – where do they intersect?” That is your BHAG! This concludes our strategy series I hope you enjoyed it as much as I did. If you have any questions please reach out to me you can book in a free 30-minute chat with a convenient link on the show notes page.